U.S. Air Force veteran Ed Correa, who served his country for over two decades, places a wreath on the grave of a veteran buried in Oak Grove Cemetery in Delaware. 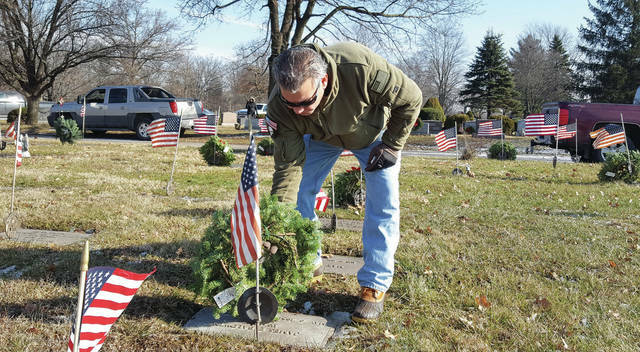 Correa, a resident of Marion, was one of countless volunteers who showed up Saturday to help place 180 wreaths on the graves of veterans as part of the annual Wreaths Across America event. Held nationwide in approximately 1,000 cemeteries, the local event was planned by the Vietnam Veterans of America Chapter 1095. Correa said he is making it his mission to bring the Wreaths Across America event to the Marion Cemetery next year. 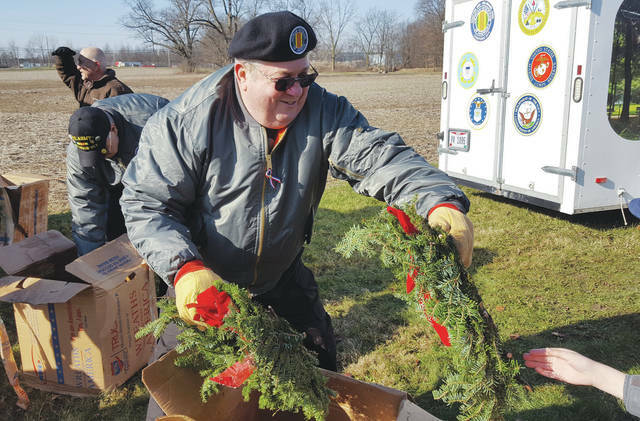 Vietnam War veteran John McAllister, who served in the U.S. Army, hands out wreaths to volunteers who gathered at Oak Grove Cemetery in Delaware on Saturday to help decorate the graves of veterans as part of the 26th annual Wreaths Across America event held nationwide. VVA Chapter President Harold B. Wolford said nearly 3,000 veterans are buried in Oak Grove Cemetery, while almost 11,000 are buried throughout the county.